It is simply to install iumio Framework Standard Edition. These command will create a project on your_project_name directory and generate the framework directory architecture. All dependencies of iumio Framework SE will be installed on vendor directory. This step install only your project directory. No app was created. Started on the second step. iumio Framework able you to create multiple app to have a better structure for your project. 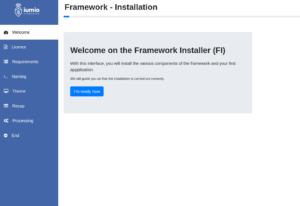 The framework was installed a dependencies named framework-install which able to install your first application with a web interface. A display message will confirm your of the server running and the url to go such as http://localhost:8000. Your will be redirected to the Framework Installer. When your would install your first application, you must to use the Framework Installer Web Tools. Follow all steps of this installer to install your first app. Install without Framework Starter Theme so you app return you a JSON display. Notice : Your application must not start with a number or a special character. After that, your will redirect to your app.